Cardboard has the great advantage, compared to other materials, of being inexpensive. Easy to work with, it can be cut, folded and allows different types of assembly (glue, staples, etc.). 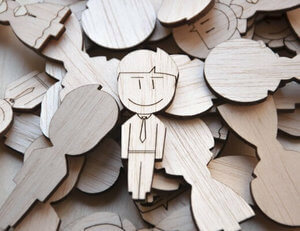 Thanks to laser cutting or engraving, numerous uses of it have become available (see the uses for more information). Made from wood fiber, cardboard is also especially ecological. It's easy and economical to produce, and light to convey. It is recycled, recyclable and biodegradable. However, cardboard has a low resistance to humidity and fire, unless it receives a specific treatment. Your laser cutting and engraving price is calculated automatically when you upload your vector file onto our website. It varies depending on factors like the amount of material used, the machine time needed and logistic costs. Once you've uploaded the file, you can make some edits on it, and see the price evolve accordingly, directly on the platform. In order to receive your model in a few clicks, you only need to login and upload your vector file . Laser cutting and engraving time is around 2 working days for cardboard . An added 24 to 48 hours may be needed depending on the vector file's size. The definitive manufacturing time is indicated on our website when you complete your order. Delivery time is added to cutting or engraving time and depends on the delivery option you've chosen. 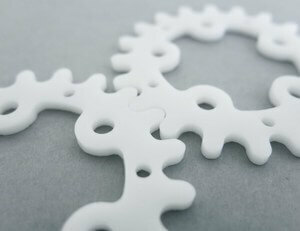 Laser cutting consists in cutting matter using a powerful and precise laser, concentrated on a reduced area. 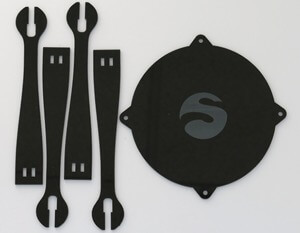 The laser can cut up to 15 mm in thickness. There are several power sources for lasers. They can be continuous or pulsated. The kerf left by the laser when cutting cardboard is small. The cut pieces aren't much deformed because the heat affected zone is very small on cardboard (around 0,5 mm). At Sculpteo, we use 100W CO 2 source laser cutting machines because they allow to cut all types of material at high speeds. Laser engraving is a subtractive manufacturing method, based on the use of a laser beam that alters an object's surface. This process allows to create images visible to the naked eye on the object. The laser emits a heat high enough to pulverize matter, creating the cavities that will make up the final image. It's a quick method, since matter is removed with each pulse of the laser. When you import your vector file, we establish, under your control, which zones are to be engraved and which are to be cut. For more information, check out our information about transferring a vector file . Cardboard is easy to use and to get familiar with. It is possible to go from neophyte to expert rather quickly. Very malleable, cardboard allows to efficiently get a result that is both economical and aesthetically pleasing. There is a common belief that cardboard is made for packaging only. In reality, it can be used for a multitude of other purposes, such as furniture, structures, etc. Thanks to laser cutting, we uncover new possible uses of the material: digital printing, packaging prototypes manufacture, modelisation (shapes, drawings), scrapbooking, etc. Cardboard allows direct printing, which some other materials don't. This enables silkscreen printing, offset printing, flexography, heliogravure, lamination, etc. Easy to repair and to store, cardboard will serve your creative and prototyping projects. It is adaptable to various constraints and can multiply its possibilities thanks to processes like film-coating (protection, waterproofing, food contact readiness, etc. ), varnishing or laminating (brilliance), gilding (luxury packaging). As for maintenance: keep your creation/object away from any source of humidity. Cardboard is highly inflammable, therefore it also needs to be kept away from known or potential sources of heat. Corrugated cardboard : paper sheets of various thicknesses alternated between flat and corrugated sheets. Corrugated cardboard is the most often used and can serve different purposes, including furniture for instance. Grey compact cardboard : rigid and thick, grey cardboard is ideal for cardboard crafting, binding, framing, displays and lithography. Cellulose compact cardboard : framing, binding and model building. The adequate paint for cardboard is acrylic paint. You have several possibilities if you wish to paint a surface: one with 100% paint, one with paint + paper, the third with 100% paper. Cardboard can absorb the paint: make sure not to dilute it too much. As for gluing cardboard, using a glue-gun is a good idea. However, you need to be fast, because the glue dries in less than 10 seconds. The structure thus assembled will be very resistant. Laser cuts and engraves material by burning its surface. Therefore, the sides of the piece tend to be darkened, and are marked slightly on the edges. When burning the surface, the laser also leaves a kerf of a width that can vary, depending on the type of material and the thickness chosen. The following chart lists the kerf sizes for cardboard as a function of thickness. For more information on assemblies, we invite you to visit our tutorial on how to prepare a model for laser cutting on Illustrator or Inkscape. Plywood is made from thin layers of wood veneer that are glued together with the grain at alternating right angles, this material offers both strength and durability.